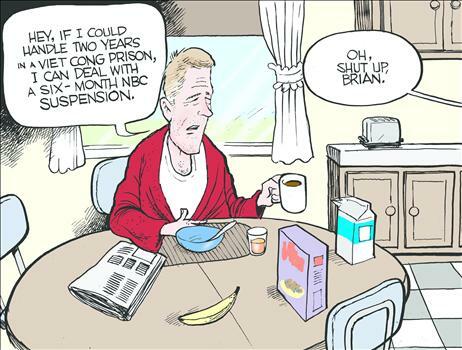 One more Brian Williams post, and then I’m done with it. For now. I think. If I were a news anchor, watched and trusted by millions of Americans, and I totally made up stories about myself and the news I’m covering, do you think I should lose my job permanently? Yes, me too. However, NBC decided on a six-month suspension without pay. Really? 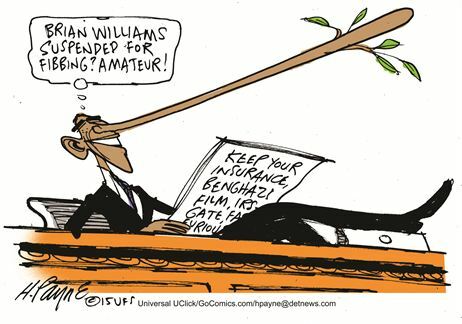 How many Americans are foolish enough to watch someone again with that kind of track record? 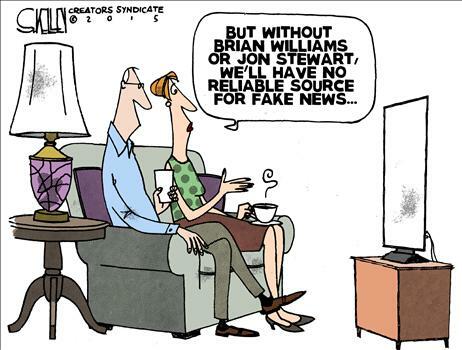 Or am I giving too much credit to Americans who continue to watch network news? 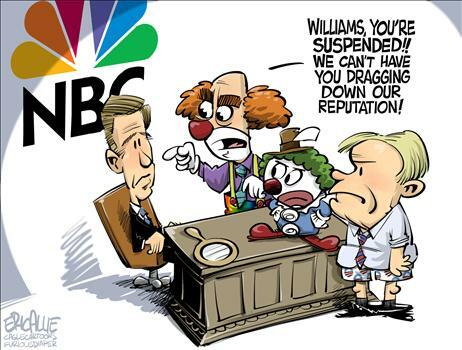 You might notice that cartoon mentioned Jon Stewart in tandem with Brian Williams. Stewart is leaving Comedy Central’s The Daily Show—only a few years too late. How many have been brainwashed by him? It’s a different type of brainwashing because it’s billed as comedy, but it achieves the same purpose. At least he is on Comedy Central, not a supposed serious news organization with a reputation to uphold. The news organization that boasts Chris—I get a tingle up my leg—Mathews and Al—I owe $4 million in back taxes—Sharpton, among others, is concerned about its sterling reputation? It’s just as much a comedy central as the one that takes the name officially. So what is Williams going to do for the next six months? Isn’t there anything in the Constitution about suspension without pay? Perhaps an amendment is in order.